You are here: Home / Coca-Cola Campaign / Creative juices start to flow . . . 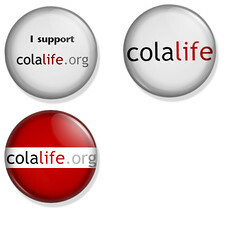 There is nothing like the prospect of a ColaLife face to face meeting to get the creative juices flowing! These badge designs just popped into my mailbox from Bertie Bosrédon. Thanks Bertie. I like number 3. The red is strong, and it shows the URL clearly. If you are wearing it, you are pretty obviously a supporter. I like the red one too – by far the strongest. Yes, red one every time. It’s much more noticeable than the others. Can Bertie ‘crinkle’ the edges like a Coke bottle top? Howard, I like your idea but I am an amateur designer and wouldn’t know how to do that. I found a free photoshop button badge template with all the layers so can change the background colour, text etc. That’s fine. There are some pretty talented and creative people involved here – I reckon some Photoshop whizz might come forward. Otherwise the button is very good as it is. I really like the red version. I think it makes you think of coca cola immediately too which would benefit the partnership both ways. Where can I get one? Maybe ask Andy Gibson @gandy who has some cool mindapples badges. Definitely the red No3 with the edges crinkled like a bottle top! Can’t wait to have one for my facebook profile please? ?